Institutional investors tend to prefer investments that are thought to contain the potential for growth, growth = sprouts. An investment has to produce a growing revenue stream – if it doesn’t grow it doesn’t compound. Gold is rejected as an investment because it doesn’t produce sprouts, meaning the steady income and systematic growth so sought after by institutional investors just isn’t there. What do you do when your country is falling apart? Well, if you’re Venezuelan President Maduro, you find bullion to sell, or use as a bargaining chip. This is a sad state of affairs especially for the people who must be enduring a monetary hardship the equal of Weimar Germany. But on the other hand, it’s a solid vindication of gold. You don’t see Maduro trying to sell bitcoin to pay the bills. Gold, for the last couple of thousand years has acted to preserve your purchasing power. In 1913 (the year the US Federal Reserve was born) when the US dollar was a dollar, gold was US$20 an ounce. Today, 116 years later, the dollar has lost 95 percent of its purchasing power and gold is bouncing around $1,300 an ounce. Gold gives all of us something that fiat (paper money), or any other financial innovation, cannot deliver. Gold is insurance. That’s what gold is, it’s insurance, sprout-less yes, but irreplaceable in its functions. Basel I, II and III are a response to the 2008 financial crisis. The regulations require banks to maintain proper leverage ratios and to meet certain minimal capital requirements. Under the old Basel I and II rules, gold was rated a Tier 3 asset. Under Basel III Tier 3 has been abolished. 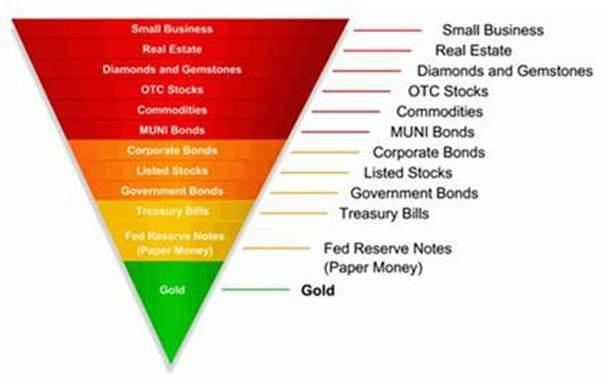 As of March 29th 2019, gold bullion is a Tier 1 asset. Also, and this is important, under Basel III a bank’s Tier 1 assets have to rise from the current 4% of total assets to 6%. The Basel Committee for Bank Supervision (BCBS), the maker of global capital requirements and whose Basel III rules form the basis for global bank regulation, just made gold a bank capital Tier 1 asset. The BCBS is a committee of banking supervisory authorities established by the central bank governors of the Group of Ten countries in 1974. The Committee’s members currently come from Argentina, Australia, Belgium, Brazil, Canada, China, France, Germany, Hong Kong SAR, India, Indonesia, Italy, Japan, Korea, Luxembourg, Mexico, the Netherlands, Russia, Saudi Arabia, Singapore, South Africa, Spain, Sweden, Switzerland, Turkey, the United Kingdom and the United States. Because gold is a Tier 1 Capital asset banks can operate with far less equity capital than is normally required. Gold is the new backstop for debt, currencies and bank equity capital. Because of the upcoming massive debt rollover, and a collapse of faith in traditional collateral values, gold just become a core banking asset. Debt has a maturity, and when maturity is reached borrowers look to roll it over. Unfortunately for borrowers the value, and high levels of esteem, of what has traditionally been thought of as good collateral (sovereign obligations – currencies) has collapsed. The latest debt figures come from a report by the Institute of International Finance (IIF). In September 2019 worldwide debt – all government, household and nonfinancial business borrowing – totaled a whopping US$244 trillion, or almost a record 318 percent of world gross domestic product (GDP). Government debt tripled from US$20 trillion in 2000 to US$65 trillion in 2018, rising as a share of GDP from 55 percent to 87 percent. During the same time period household debt increased from $17 trillion to $46 trillion (from 44 percent to 60 percent of GDP) and nonfinancial corporate debt rose from $24 trillion to $73 trillion (71 percent of GDP to 92 percent). Rollover risk is high, according IIF data emerging-market borrowers face US$2 trillion of debt maturing in 2019. John Exter is known for creating Exter’s Pyramid – useful for visualizing the organization of asset classes in terms of risk and size. When the credit system is expanding most money flows to the top of the pyramid – the increasingly speculative and illiquid investments. When the credit system comes under pressure and debt cannot be repaid, the items at the top of the pyramid get sold and money flows to the bottom items. After the 2008 financial crisis government bonds – Greece and Italy come to mind – lost nearly all their value. Mortgage backed securities, innovative instruments, are near worthless. A quick scan of recent news reveals bonds are tiring, stocks are struggling, real estate is collapsing and small business is still being decimated by online sales. As already discussed the US$ – paper money, the world’s reserve currency – has lost 95% of its value. According to the World Gold Council, central banks backed up the truck for gold in 2018, buying 651.5 tonnes versus 375 tonnes in 2017. That’s the largest net purchase of gold since 1967. Bloomberg reports that within a decade, the Russian central bank has quadrupled its bullion reserves, an effort that continues. In February the Central Bank of Russia added a million ounces, the most since November 2018. Central banks clearly see the value in increasing their gold reserves. After the massive value destruction suffered holding paper assets (After 2008 MBS lost most of their value and many sovereign securities are today, also near worthless), perhaps almost a doubling of gold bullion purchases in 2018 over 2017 totals is indicative they believe gold is a better Tier I asset then government debt and mortgage backed securities? There is also that 2% increase in total assets to 6% that now needs to be filled, likely by gold. For me, and you, gold is insurance. For the banks who hold the world’s debt, gold is the new backstop. It will be an interesting exercise to watch future Central Bank gold bullion purchases.